Serving up the latest in Alzheimer's Association, WV Chapter news along with recipe reminders to take care of yourself. Advocacy is no longer calling in or meeting with your legislators. We have to deploy a variety of methods, sometime all at the same time to ensure we are building pressure to make things happen. From in person visits, to emails, to phone calls, to social media. Last week we orchestrated one of the most effective advocacy efforts - the Congressional hearing. As you probably saw on TV, radio, Twitter - Seth Rogen testified at a Senate appropriations committee. But, what you may not have seen is the whole testimony from a variety of experts. Dr. Francis Collins brought a team of experts from the National Institute of Health to talk about the latest advancements in research and Congressman Dennis Moore testified about living with Alzheimer's disease and the challenges he and his wife faced after his diagnosis. You can watch the entire 2 hours by clicking here. We learned from Dr. Francis Collins about the latest advancements in Alzheimer's and dementia research - but most importantly we learned what the extra $100 million in research funding will fund. Exciting and cutting edge science that otherwise would not happen. This team of experts has now set the tone for the next team of experts - YOU! You are the critical lever of our advocacy force. We are hard at work scheduling our meetings for the Advocacy Form in Washington, DC and our meetings before and after the forum to meet with in-district staff. If you would like to join us on these meetings, email wvinfo@alz.org or call 800.272.3900. We need your VOICE to tell Congress, address Alzheimer's disease now! Living with Alzheimer's POSTPONED. Due to incredibly terrible weather we are postponing our Parkersburg and Charleston Living With Alzheimer's events until next Monday at 2 pm. For more information call 800.272.3900. Caregiver University ONLINE Registration is OPEN! Register now for a Caregiver University near you! Space at a number of our venues is limited, so register early! Dance to END Alzheimer's! Join us for Dancing Through Time, March 22 at Erickson Alumni Center in Morgantown! This fun event raises funds to support our mission! You can vote for your favorite dancing star and buy tickets online! Calling all Marshall's shoppers! Marshall's is once again collecting donations at their cash registers to support the Alzheimer's Association! Visit your nearest Marshall's store between March 2 - 15, and be sure to thank the cashier for supporting our important cause! Alzheimer's Disease: Basics of Best Care on March 20! This 2-hour training meets the OHFLAC annual dementia care training requirements and includes social work or nursing continuing education. Space is limited, pre-registration required! Email wvinfo@alz.org or call 800.272.3900. Something about apocalyptic storms makes me crave a giant pot of chili. Let me tell you, it was probably my best pot yet. I will post the recipe next week. But, I want to offer up my secret ingredient. Which, if you have been following this blog for a while you know know the answer. Leaving Texas, I found that the chile is no longer the base of chili. 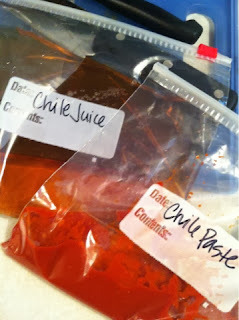 Most recipes call for chili powder - which is good. But you lose so much of the rich and complex flavors of real chiles. I make what I call chili paste as the backbone of my chili (which it isn't really paste at all, more of a liquid) but you can use this for all kinds of things. Pour over your taco meat, base of enchilada sauce, spice up your boring chicken breast. So yesterday I made a little extra to keep in the freezer. My favorite bi-product of making chili paste is the chili water. It adds so much flavor and a little bit of heat to any soup our stew you are making. 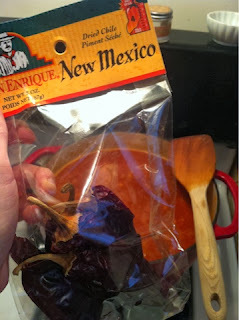 You can buy a number of different kinds of dried chiles at your local grocery store, yesterday I used New Mexico chiles, they offer a slow burning after heat that is perfect for a spicy chile. So try different ones to see what kind of flavor you like best. In a medium sauce bring 3 cups of water and 5-7 chiles to a boil, covered. Reduce heat and simmer for 1 hour. Depending on your time frame you can go ahead and blend your chiles now, or you can let them soak for as long as you want. When you are ready to blend, remove stems (I keep the seeds, but you can also remove the seeds) and place in a food processor or blender. Add at least 1 to 1 1/2 cups of the chile water. BLEND! You want to blend until the mixture is smooth. Use what you need in your recipe and then freeze the rest. Then IMMEDIATELY WASH YOUR HANDS! A step I often forget and my lips or nose burn the rest of the day!